Kangaroo Ground is a rural and urban district north-east of Melbourne. Its village is 26 km from central Melbourne, and the district extends about 5 km eastwards. There is also an extensive area formerly known as Kangaroo Ground South, which borders Warrandyte North. The village location was settled in 1842, being on hilly but relatively open woodland with good soil. It attracted grazing kangaroos – hence the place name. Land selection began in the 1850s, and a community predominantly of Scottish descent grew up. In 1851 a school began and Presbyterian church services gained their first permanent abode. Between 1854 and the mid-1860s gold mining in the Diamond Creek and Warrandyte areas provided a market for Kangaroo Ground farmers. A hotel opened in 1864. The absence of a town survey inhibited the formation of a village, and the sparseness of buildings remains evident today. The general store is the most notable structure, overlooked by a memorial tower (1926) on Garden Hill about 800 metres north-east. The structure, modelled on a Scottish watchtower, is a memorial to all those in the Eltham Shire who died in World War I. It is also used for fire spotting. Kangaroo Ground had been good for cereal and pasture crops, and hay and fodder production grew as wheat production was taken over by the Wimmera and Mallee regions. Fruit growing was widespread until the 1930s, as were market gardens. They were overtaken by other more productive locations and dairying became viable with milk transport available on the Hurstbridge railway line. However, milk contracts favoured bigger holdings in the postwar period, and farms were amalgamated. 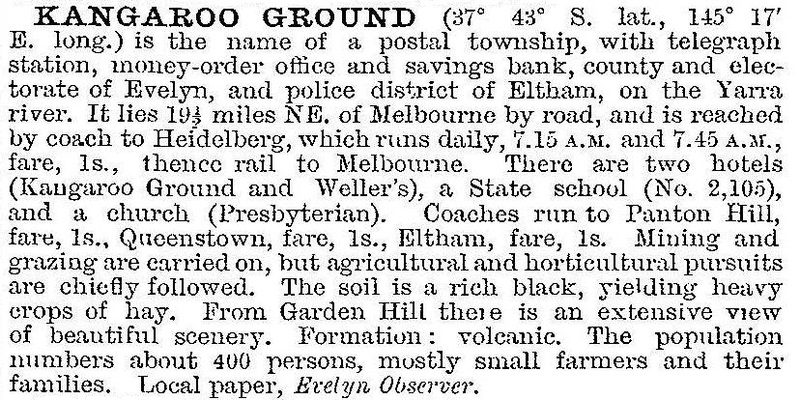 They could not be subdivided for hobby farms after the 1971 Melbourne Master Plan put a minimum threshold on farm sizes. Electricity supply did not come to Kangaroo Ground until 1958, but its open landscape was crossed by a bulk supply transmission line ten years later. In the 1970s the threatened inundation of east Kangaroo Ground was averted by the building of the Sugarloaf Dam.